Meet Lily Lily has the worried look of a lost little puppy. Even as her wrinkly forehead is adorable, Lily carries the world weary looks of a puppy much older. You see Lily and her siblings saw their mom get hit by a car trying to get them to safety. A kindly stranger saw the puppies and brought them to us on March 5, 2019. Lily is about 10 weeks old. She is thought to be a Boxer mix. Lily has a sweet and curious disposition and delights in the comforts of her other siblings. She loves to cuddle and snuggle in your arms. And, with the sweet smell of puppy breath, Lily loves giving puppy kisses. Lily is a cute little butterball that would love to be taken home and loved on. In return she will make for a loyal and fun companion. 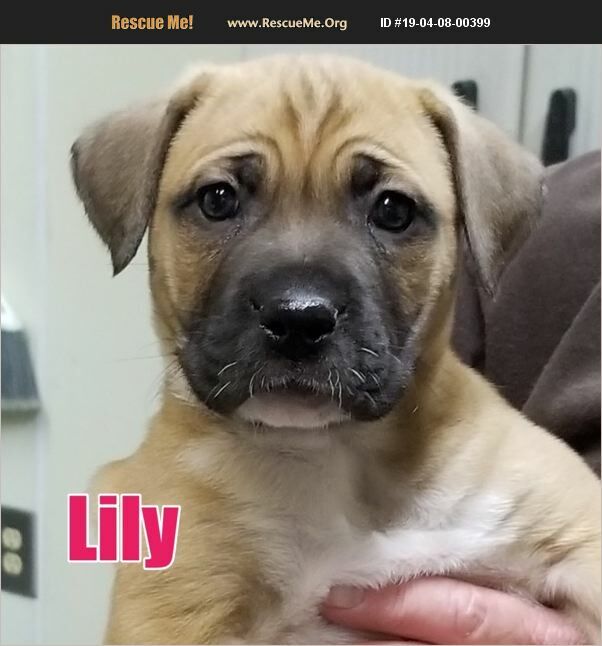 Come meet our Lily. She just may capture your heart. Her siblings are pretty cute too and you might just want to adopt another to keep her company. Lily has age appropriate vaccinations. Call 706-865-4135 for information on additional health services provided as part of the adoption fee. If interested in one of our puppies or dogs, please submit an application online or at the shelter. Applications can be submitted online at: https://www.charlessmithgallhumanesociety.org/page/dog- adoption-application Once an application is submitted online, you will receive an email saying your application has been successfully submitted. If you don't receive this email within 24 hours, please check to make sure all application fields were completed or please call our shelter at 706-865-4135. All adopters must complete an approval process which involves a reference check with current/recent vet and a brief home visit if located in the immediate area. We do permit out of state adoptions. Adopters MUST come to the shelter to transport their new family member home. We do not ship nor do we transport them to their new homes. Adoption policies and application procedures are detailed at the shelter website: http://smithgallhumanesociety.org/ under tab All Adoptable Animals. Charles Smithgall Humane Society (CSHS) is a No kill shelter. Animals in our care remain safe with us until adopted. Resident animals are primarily owner relinquished and also accepted from local Animal Control. The facility usually is operating at capacity with a list of animals waiting for space to open. Adoption hours are Tues-Sat 10-4 and Sun 1-4. Closed Mondays Location: 4823 Helen Hwy. 75N, Sautee, GA 30571, Phone: 706-865-4135 Email: smithgallhumanesociety@windstream.net Our shelter in Sautee GA is located about 3 miles south of the alpine town of Helen in northeast GA.